BERNARD, HEWITT, lawyer, militia officer, editor, and civil servant; b. 1825 in Spanish Town, Jamaica, eldest son of Thomas James Bernard and Theodora Foulkes; d. unmarried 24 Feb. 1893 in Montreal. Hewitt Bernard’s father, a sugar plantation owner in Jamaica, fell on difficult times after the slave revolt of 1832. Like many planters he had numerous functions, among which were justice of the peace and, for a time, attorney general. Young Hewitt was sent to school at Bath, England, and on returning to Jamaica in the 1840s he set up a law practice. After his father’s death from cholera in 1850, he became the head of the family. Concluding that he no longer had a future in Jamaica, in 1851 he left for Canada, to establish himself in practice. A letter of introduction brought him to James Patton, a lawyer in Barrie, Upper Canada. Bernard’s ability, manners, and steadiness made him a welcome member of society there, and in 1854 it was decided that his mother and his sister, Susan Agnes*, then both in England, would come to Barrie. In 1855 he joined the local volunteer militia, the Barrie Rifle Company, eventually becoming a lieutenant-colonel. That same year the provincial capital moved from Quebec to Toronto, and by 1857 Attorney General John A. Macdonald needed a capable private secretary. Macdonald invited Bernard, then co-editor of the Upper Canada Law Journal, to accept the position, which would be attached to his department. 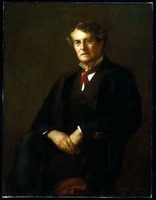 Bernard began work in February 1858 and in March 1859 succeeded Robert Alexander Harrison* as chief clerk, at which time Bernard’s function as Macdonald’s secretary probably ended. The following year he became deputy judge advocate general, a post analogous to deputy attorney general. 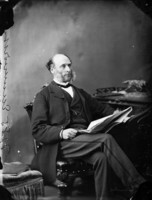 By 1864 he was sufficiently important that Macdonald had him act as secretary to the conferences on confederation held that year in Charlottetown and Quebec and at the London conference during the winter of 1866–67. In February 1867 Bernard escorted his sister up the aisle of St George Hanover Square in London on her marriage to Macdonald. On 1 July Bernard became the new dominion’s first deputy minister of justice. Macdonald, the minister, left him with virtually the entire management of Canada’s penitentiaries (at Kingston, St John, and Halifax) and with the establishment of new ones at Saint-Vincent-de-Paul (Laval), Que., and Lower Fort Garry, Man. [see Samuel Lawrence Bedson]. In 1868 Bernard took the lead in arranging for witnesses and evidence in the inquiry into the assassination of Thomas D’Arcy McGee* and in the subsequent trial of Patrick James Whelan*. 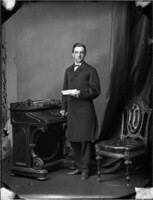 As the first years of confederation wore on, Bernard gradually assumed the role of leading deputy minister. At the time of the federal election of 1872, with every minister out of town, he was effectively the major-domo for the whole government. In the midst of that sweltering August, Bernard was invited by Postmaster General Alexander Campbell to spend a few days at the lake. Bernard, ruefully, said no. “Do not think me conceited,” he wrote to Campbell, “when I tell you that I do not think I ought to be away from Ottawa for an hour. . . . I have to answer letters and telegrams, and look after important business all day – and that from British Columbia to Halifax.” Work was his only consolation for having to live in Ottawa, which he called the “Ultima Thule of ennui and wretchedness” and a “hot, dusty, fifth rate little Peddlington.” In November 1872 he was made a qc and a month later a cmg. 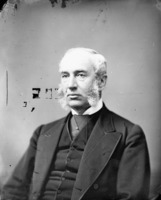 When the Liberals came into office in November 1873, Bernard continued as deputy minister of justice under Antoine-Aimé Dorion. It says much for his integrity that he remained in the post, even continuing to live with the Macdonalds, without, so far as is known, a whisper being raised against him by ministers of Alexander Mackenzie’s government. Poor health caught up with him in 1876 and he resigned in August, though he periodically became involved in government business thereafter as a consultant. He began to spend winters in the south for his illness; it is not known what it was, perhaps osteo-arthritis, but the ailment seems to have been slowly cumulative. By the mid 1880s he needed special meals, care, and quiet, though a four-hour visit to Earnscliffe, the Macdonalds’ residence, was part of his daily routine in spring and fall. In winter he would go south to a sanatorium, eventually to Lakewood, N.J. According to a description by Edmund Allen Meredith in 1890, the drawing-room of the Macdonalds’ summer house at Saint-Patrice, near Rivière-du-Loup, Que., looked like a hospital ward, with Bernard “seated like a mummy” in the middle of the room, Margaret Mary Theodora Macdonald (she was hydrocephalic) on a couch in the corner, and Lady Macdonald presiding, as usual, in robust health and strength. She needed both. Her description in 1892 of afternoon walks at Lakewood with her daughter, Mary, in one wheelchair and Hewitt in another, is a vivid comment on the exhausting duty that was often the lot of devoted relations. Bernard moved to the Windsor Hotel in Montreal for the winter of 1892–93, and he died there in February, “a martyr to rheumatic affections,” as a family friend, Thomas Charles Patteson, later recalled. Hewitt Bernard’s correspondence as deputy minister of justice is in NA, RG 13, A3, 554 et seq. Occasional letters from him are in the Sir Alexander Campbell papers (AO, MU 469–87) and in the Thomas Charles Patteson papers (AO, MS 22). There is much about him in Louise Reynolds, Agnes: a biography of Lady Macdonald (Toronto, 1979), as well as in Affectionately yours; the letters of Sir John A. Macdonald and his family, ed. and intro. J. K. Johnson (Toronto, 1969); J. A. Macdonald, The letters of Sir John A. Macdonald . . . , ed. J. K. Johnson and C. B. Stelmack (2v., Ottawa, 1968–69), 2; and Gwyn, Private capital. Genealogical information is provided in Chadwick, Ontarian families. P. B. Waite, “BERNARD, HEWITT,” in Dictionary of Canadian Biography, vol. 12, University of Toronto/Université Laval, 2003–, accessed April 22, 2019, http://www.biographi.ca/en/bio/bernard_hewitt_12E.html.